The inverter will give off a smooth humming noise when properly connected to the input (DC side) and LumiLor (AC side). The inverter noise will change from a smooth hum to a high pitch whine or a low pitch choppy sound if the inverter is being taxed due to improper insulation or due to too large of an area being lit. If everything is connected properly and the inverter gives off no hum then the inverter might need to be replaced or there is a short on the LumiLor side. If power is connected and the inverter has a hum but there is no light from the LumiLor then the problem is either in the connectors on the AC side, connectors on the LumiLor itself, or the LumiLor itself burned out due to improper application or exterior damage. Burning or extremely hot wire indicate a short where wires are crossed, the substrate is shorting to itself, or the proper gauge of wire was not used. Inspect from the power source to the inverter that the wires are connected positive to positive (red to red) and negative to negative (black to black). Wire from power source to inverter should be at least 18 gauge. If there is an issue replace or re-wire as needed. 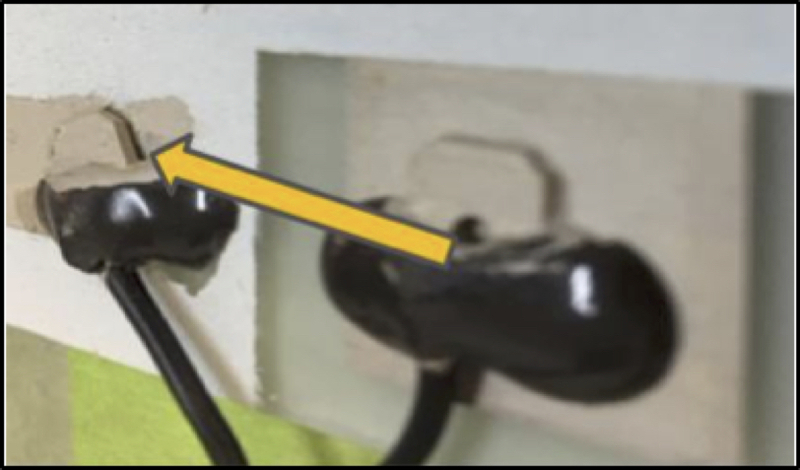 Wires from inverter to LumiLor that are hot to the touch indicate improper wire gauge or crossed wires. Wires from inverter to LumiLor should be at least 22 gauge. Connectors within the electronics have pins that can to loosen over time and weaken the connection. Disconnect the male and female connectors and verify the pins inside the connectors are still intact and making a good connection.Replace and rewire new male and female connectors if needed. Issue can occur when there is an improper connection due to gap between connector and substrate. Inspect the area around the connection for burning or lifting of any connectors.If any damage is visible, remove the connector and the double sided copper tape. Re-apply new double sided copper tape and make sure to press firmly on the connector and hold pressure to allow the adhesive to fully bond. A direct short can occur at any point in time if the application process was not followed properly. A short is when the backplane and busbar are touching each other somewhere within the LumiLor system. To test for a direct short, use a multimeter in the ohm setting and place the two prongs directly on the pins in the male connector that is connected to the LumiLor. Make sure the prongs of the meter do not touch each other. A reading measured in mega-ohms indicates LumiLor is functioning properly. A reading measured in standard ohms indicates a short in the system. The short needs to be identified and eliminated or LumiLor needs to be removed and re-applied. A reading of zero indicates an incomplete circuit and needs to be evaluated to make sure all connections are properly in place. If LumiLor is applied improperly it can burn, char, and/or discolor. 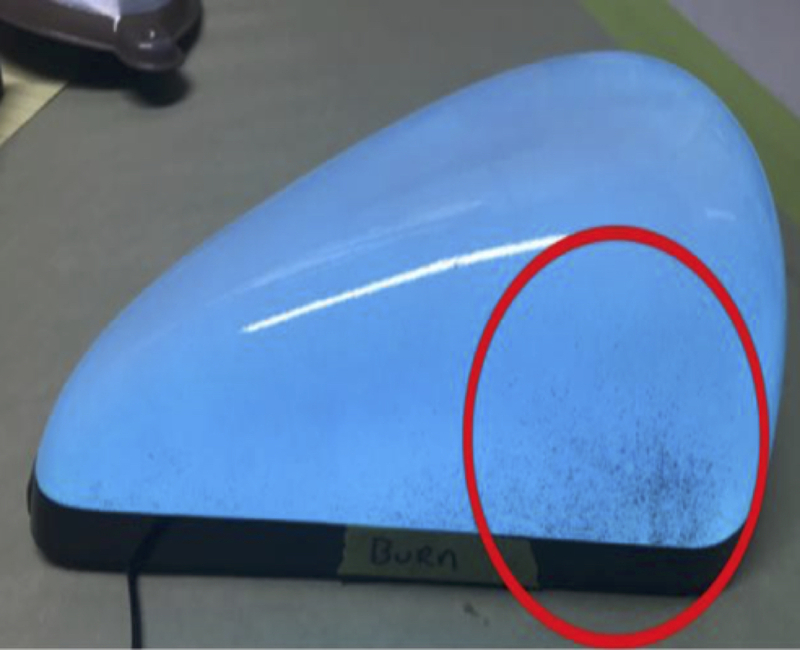 Inspect the LumiLor, with power off, and if there is any evidence of discoloration or charring on the surface itself then the LumiLor will need to be removed and reapplied. Discoloration and charring will most likely occur along the edge of the backplane that is under all the layers or around the connection site. Once all troubleshooting steps have been completed and LumiLor still does not turn on it means the LumiLor was applied improperly and the LumiLor will need to be reapplied. Each and every step of LumiLor will need to be followed with attention to detail and exactly as it is demonstrated.